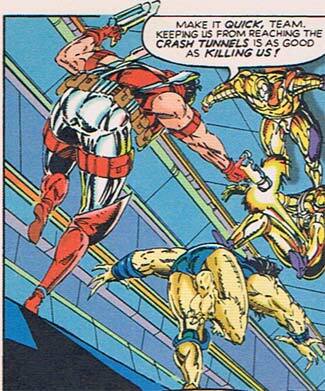 ← Random Panel: "Also, his legs turned into guns. That is all." A new day dawns, with two left feet. Yes, my friends, I have decided that I should not be the only one subjected to the eye-gouging agony arising from forced reading of Nineties-era Image comic books. So now you have to suffer too, because that's how America works, you commie bastards. Six figures, five visible feet. Well played, sir. And while I appreciate the nod to Jack Kirby, I am pretty sure a page like this is not the way to honor him. Brrrr. But those are just the regular members. When you need the best of the best, you have to build your own genetically modified No Feet Warriors! I guess whatever goo that is they're floating in either makes your feet invisible, or completely dissolves them. Handy! 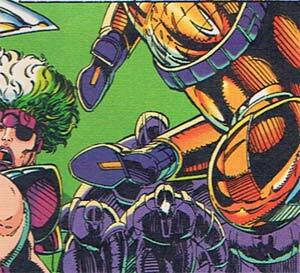 Rob Liefeld, keeping the world safe from the Non-Matching Foot Menace since 1992. 17 Responses to A new day dawns, with two left feet. And of course, you can imagine the laughter, the jokes, and the emasculation that took place afterward. And as Youngblood ran– how is anyone’s guess– into the night, he ripped at his starchy, royal blue tux and cried into the night that he would turn his two, awkward left feet into the deadliest lethal footsies the world had ever gawked at! Well played, Jeffrey. Well played. The challenge, of course, when engaging in Leifeld mockery, is to keep one’s observations tightly focused on one aspect of Leifeld stupidity. Allow me to add an additional observation. In the panel with Dr. Wells and the strangely footed “experiment,” I will assume, based upon the caption, that we are seeing a scene from 1937. Please note: Rob Leifeld is so stupid, lazy, whatever, that he cannot be bothered to illustrate technology that looks remotely period-appropriate. Oh no. Why go to the trouble of actually *researching* period technology when just drawing what you always draw works just as well? And don’t get me started on that caption. Leifeld shouldn’t be let near a word processor, much less a pencil. 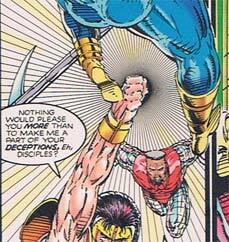 I can’t draw to save my life and I don’t like Rob Liefeld’s artwork. Never have. He could learn a lot from studying the artworks of Steve Ditko, Neil Adams, and (my favorite) Rich Buckler. Buckler’s artwork in the “Astonishing Tales” featuring Deathlok the Demolisher is fantastic! Well played, Whit, I laughed out loud at that one! YES! Finally a GOOD reason to go on a drunken stupor binge on Fridays! YES! I wonder what was Liefield reaction when he learned that he would be a guest artist on a issue of Teenage Mutant Ninja Turtle and that he would have to draw… Foot Ninjas! Seriously, dude, if he ever finds out the way you’re teeing off on him all the time on this blog, he’s gonnna sue your a** for defamation of character or something. He was, arguably, the most influential comics creator in the Nineties, setting the tone for the direction of the industry for a good ten years. He made bazillions of dollars. He’s still very much a working artist, and he has gotten somewhat better in the seventeen years since the one above. I don’t know him as a person at all, having never met him. He might be a devil or a saint, I don’t particularly care. What I care about is comics, super-hero comics in particular, and he’s largely responsible for the (in my opinion) horrible wrong turn the industry took “back in the day”. 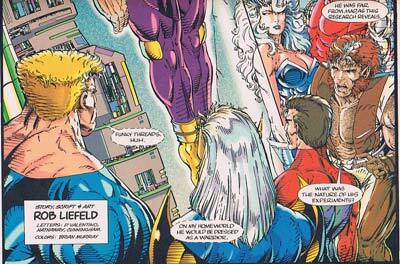 I stopped reading them altogether until about four years ago, mostly because everything was in the Liefeld mold — stupid, knocked-off characters in violence-laden idiotic “plots” drawn in a hasty, lazy, amateurish, hackish, all-glitter-and-no-gold style he popularized. So yes, I’m a little biased where his work is concerned. Like I said, I don’t know him at all, he may be the best guy in the world as a human being. But his art and his impact on a medium I really love deserve to stand up on their own for judgment. And in my judgment, it was (and is) just awful in pretty much every way. 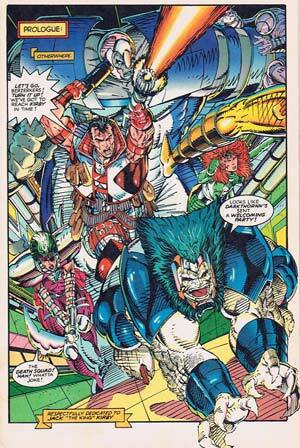 I stopped buying, reading, and enjoying super-hero comics BECAUSE of Rob Liefeld and his friends. When the ‘biggies’ left Marvel to form Image, Marvel’s new employees were just copying Rob and his crew. Remember that Spike Lee ad featuring Rob after he created “X-Force”? That’s what they wanted: a recipe style without original substance. The creative process wasn’t as imporant as taking a buck from fanboys. 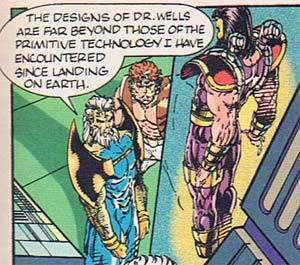 It still isn’t, evidenced by the 21st century REVAMPires in the comics industry. I’ve pointed this out before; some fans may prefer their own idea of what a Superman or Spider-Man could be across the art board. However, Robbie the Copybot to this day is incapable of dedicating himself to grow as an artist. Besides, you can’t sue for defamation or the like unless you can prove the statements in question false. I’m beginning to think that’s why he tries to avoid drawing feet. Gosh Willie, you’re right, I should go pick some incredibly obscure publisher who never made a dime, struggling to pay the bills, but who has artistic aspirations, and crap all over THEIR product! Liefeld is still a millionaire, is still putting out product, and still has a pretty big influence on the industry. He’s fair game. Plus, he had an incredibly negative impact on a medium I absolutely love. I actually think delving into just what went wrong with the comics industry in the late Nineties — i.e. the Image Effect — is a very worthwhile thing to do, because it can easily happen again. In fact, I wouldn’t be surprised if comics are right at the edge of another bubble like that one, with the crowded marketplace, the dearth of good ideas in the mainstream books, and the state of the economy. Finally, since when is difficulty or courageousness a prerequisite to blogging?! I wallow cheerfully in the muck, and cast no aspersions on those who decline to participate. For those who do, come on in, the mud feels great! Down with the Image Effect!